Important in acid-base chemistry, our buffers and volumetric solutions are available in a range of sizes and concentrations to meet your needs. The quality of your measurement results depends upon the quality of your standards, buffers, and reagents. 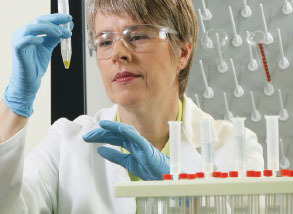 We offer pH buffers and test kits for a variety of applications. Convenient and ready-to-use high quality volumetric solutions manufactured from analytical grade chemicals, precisely adjusted for accurate and reliable titration results. A wide variety of buffers for all aspects of life science research including cell biology, molecular biology and protein biology.